World Champion skater Jenna Downing is hoping Holy Cross students will glide through their GCSEs. Inline skater Jenna is a ten times British Champion and has mentored 12 Year 11 girls over four sessions. Jenna is working with the Youth Sport Trust as part of their ‘Get Exam Fit’ programme. 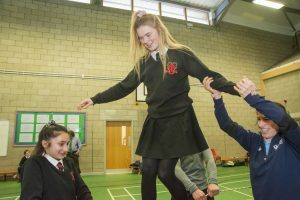 Get Exam Fit is a package of support which helps build the confidence of students, manage their physical and emotional wellbeing and achieve their potential in school examinations. They use high profile athletes during the school year, to come in and talk to the students, hold workshops and support them. In the final session, Jenna challenged one student, Niamh, to walk on a tightrope, held by fellow students. They also had a go at in-line skating supported by Jenna. Head Girl Alana said: “ It’s been amazing. Jenna is inspirational and she has taught us how to motivate ourselves. “It’s been a great session,” said PE teacher Mr Stokes. “Jenna had won all her British Championships by the time she was 21 so she knows how to deal with pressure at the highest level.